Edgar Wright joins us to talk the films of George Miller! It’s an episode of some significance as we welcome Rochelle Siemienowicz on board as the new co-host of Hell Is For Hyphenates. Rochelle and Lee chat about some of the key new releases of this month, including Steven Soderbergh’s hillbilly heist Logan Lucky (02:04), Luc Besson’s sci-fi epic Valerian and the City of a Thousand Planets (08:21), Claire Denis’s comedic drama Let Sunshine In (13:39), and Agnès Varda’s rural France road trip documentary Faces Places (18:26). This entry was posted in podcasts and tagged 40 000 years of dreaming, babe: pig in the city, bright sunshine in, edgar wright, faces places, george miller, happy feet, happy feet two, let sunshine in, logan lucky, lorenzo's oil, mad max, mad max 2: the road warrior, mad max beyond thunderdome, mad max: fury road, nightmare at 20 000 feet, the witches of eastwick, twilight zone: the movie, un beau soleil intérieur, valerian and the city of a thousand planets, visages villages on August 31, 2017 by The Hyphenates. How do you pick two films that satisfactorily summarise the career of someone like George Miller? It’s not easy, but we think we can do it, and we’re gonna do it with sequels. Your evening kicks off with Mad Max 2: The Road Warrior, the film that obliterates the ambition of every other sequel in history by casually pointing out that there was an apocalypse at some point between the first film and the second. That brazen move is enough to make this a must-see, but it’s also one of the greatest Australian films of all time, one that helped redefine an entire nation’s cinema. Max is an anti-hero for the ages, a road warrior reluctantly enlisted as saviour by a group of desperate survivalists. Once you’re finished this dystopic action film, follow up with that other George Miller sequel set in a familiar yet distant reality, Babe: Pig in the City. Considered a disaster on its release, the film has since been reassessed as a modern classic, a dark fairytale that feels like something the Brothers Grimm would make if they were filmmakers. It’s got heart and there’s a morality lesson, but there’s also a lot of very strange and disturbing stuff you don’t normally see in a family film. Which is part of the reason it works so well. Substitutions: If you can’t get or have already seen Mad Max 2: The Road Warrior, get your hands on the original: Mad Max (1979). It may be slightly eclipsed by subsequent entries, but the pre-apocalyptic ur-text is still an all-timer. If you can’t get or have already seen Babe: Pig in the City, track down Happy Feet Two (2011). Like Pig in the City, this is another sequel ostensibly aimed at kids, but refuses to walk the same ground as its predecessor as it leans hard into a bleaker tale for its heroes. The Hidden Gem: Want to see something off the beaten path, a title rarely mentioned when people talk about the films of George Miller? There aren’t that many to choose from given every film he’s made holds an important place in the canon, but it appears that Lorenzo’s Oil (1992) may have slipped a little out of the general consciousness recently. And that’s a shame, because the only outright drama that Miller made is as deft and compelling as his genre work, a tear-jerking true story about two parents giving up everything to find a cure for their son’s disease. The next episode of Hell Is For Hyphenates, in which we discuss the films of George Miller, will be released on 30 August 2017. 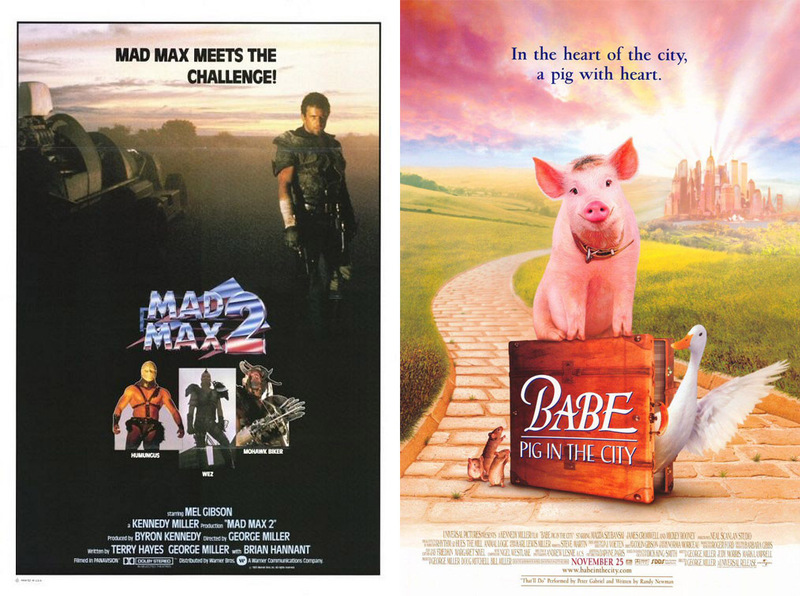 This entry was posted in blogs and tagged babe: pig in the city, cheat sheet, george miller, happy feet two, lorenzo's oil, mad max, mad max 2: the road warrior on August 25, 2017 by The Hyphenates.